On 7 September, Curtin alumni from across the decades gathered in London to celebrate 50 Years of Innovation. The event, which was hosted at the historic Australia House by the Agent General for Western Australia, Mr John Atkins, was attended by more than 70 of our alumni now living and working across the United Kingdom. It was the first formal Curtin event held in London. A delegation of senior Curtin staff, including Chancellor Colin Beckett, Vice-Chancellor Professor Deborah Terry and Pro Vice-Chancellor International, Professor Seth Kunin, took the chance to meet with the graduates and hear what they have been up to since completing their degrees. They also took the opportunity to update them on some of Curtin’s recent developments and to outline the University’s global vision. 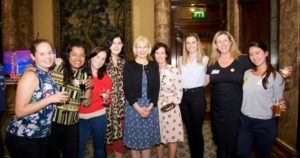 Director of Alumni and Advancement Services, Erika Beazley said there was a great sense of excitement and positivity amongst all of the alumni who attended the London event. “Many of the attendees had moved to the United Kingdom not long after graduation, some had not been back to Perth, let alone stayed connected to Curtin, so it was really special for them to reconnect with each other and the University,” Ms Beazley said.